This small group exploration affords the chance to experience this magnificent and memorable country in a very personal way. You will have your own knowledgeable and experienced safari guide who will enhance your enjoyment of this unique country by making it a fascinating and stress-free journey of discovery amidst very dramatic scenery. Extend your safari and include a night or two at Okonjima Luxury Bush Camp. This gives you the opportunity to get an in-depth insight into the AfriCat Foundation as well more sightings of cheetah, leopard and other big cats in the wild. Depart Windhoek and drive through the scenic Khomas Hochland highlands before heading down the Great Escarpment into the Namib Desert. Spend two nights at the only camp inside the world's 4th largest National Park. Explore the remarkable sights of the Namib Desert with your guide. Visit Sesriem Canyon, explore Elim Dune and the Dead Vlei. Climb some of the world's highest free-standing dunes! A fascinating drive today northwest through awesome and ever changing desert landscapes. 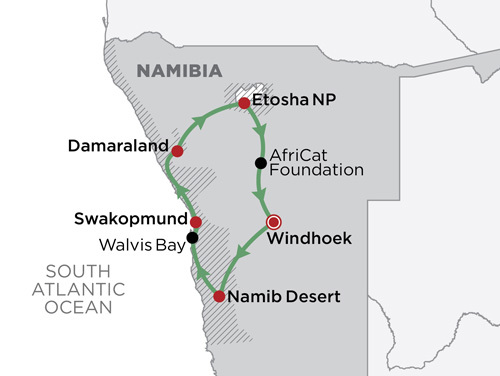 Meet the coast at the port town of Walvis Bay and then continue north to Swakopmund where you can enjoy the pleasant seaside location and cooler coastal air for your next two nights. Enjoy dinner at a popular restaurant specializing in fresh seafood. Options today to sea kayak at Pelican Point or take a motorised boat. Here you should see Cape fur seals, bottlenose dolphins, pelicans, flamingos and if you are lucky whales and leatherback turtles. Continuing on your safari, into the diverse region of Damaraland. Pass Namibia's highest mountain, the Brandberg and take time to view game and absorb the vastness of the scenery along the way. During your time in Damaraland enjoy an exciting 4x4 excursion in search of the elusive desert adapted elephants if they are in the area. You will also visit pre-historic Twyfelfontein rock engravings (recently declared a UNESCO World Heritage Site), Burnt Mountain and the Organ Pipes. Your journey continues to Etosha National Park, travelling via the scenic Grootberg Pass. Along the way your guide will take you to visit a local Himba settlement if they are in the area. Picnic lunch en-route and arrival will be in the very late afternoon or early evening (after a long but rewarding day). Have a relaxing evening watching wildlife at the camp's floodlit waterhole. Today is dedicated to a full day of exciting game viewing within the central section of Etosha National Park from your private safari vehicle as you make your way from the southern Andersson's Gate to Halali (where you may stop for lunch) and then on across via selected waterholes such as Goas, which are normally particularly good for game viewing, to Namutoni Camp in the east. You will have to leave the Park before sunset and head out to stay at the delightful Onguma Tree Top Camp with enough time to relax and freshen up before for dinner. The rest of the evening can be spent game viewing at the camp's floodlit waterhole where game comes and goes throughout the day and night. Another morning dedicated to memorable game drives within the eastern section of Etosha National Park with your guide. You return to camp for lunch and an early afternoon rest, spending your final afternoon on a game drive on the private Onguma Game Reserve, finishing with a delicious sundowner overlooking Fischer's Pan. You then return after sunset with enough time to freshen up and enjoy your final 'safari dinner' overlooking the camp's floodlit waterhole. En route back to Windhoek we will visit the world renowned Big Cat research centre run by the AfriCat Foundation.